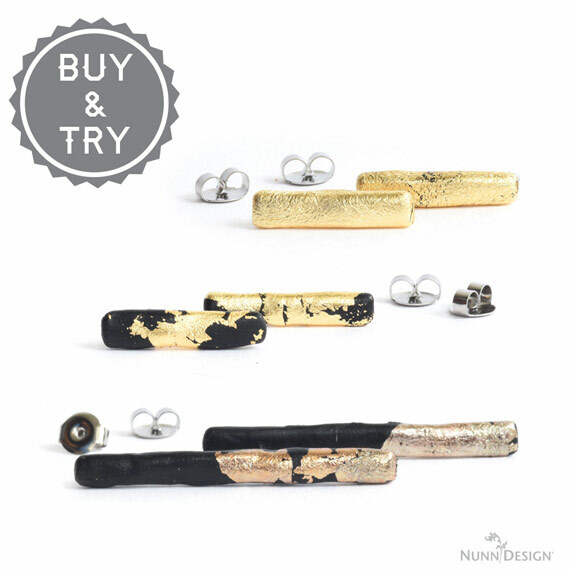 You are here: Bitsy Rings and Bar Earrings Buy & Try Offer Ending November 5th! ← 2018 Fall Collection Features Hoop Earrings! Be Inspired! During our Buy & Try programs we offer items in special quantities or combo packs to make it easy to buy and try a new technique. For wholesalers we also waive the $100 wholesale minimum requirement during the special offer period. On November 5th the special Buy & Try period will come to an end. Please take a moment to review the Buy & Try Program and take advantage of the opportunity to try something new. Once the Buy & Try offer expires, the $100 minimum goes back into effect for our wholesaler buyers and the findings return to being sold in our normal bulk packs. For people who are not wholesalers, nothing changes! 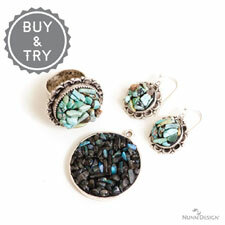 You can still shop the items in the Buy & Try program! Look below for all 6 projects, their tutorials, downloadable PDFs and supplies! 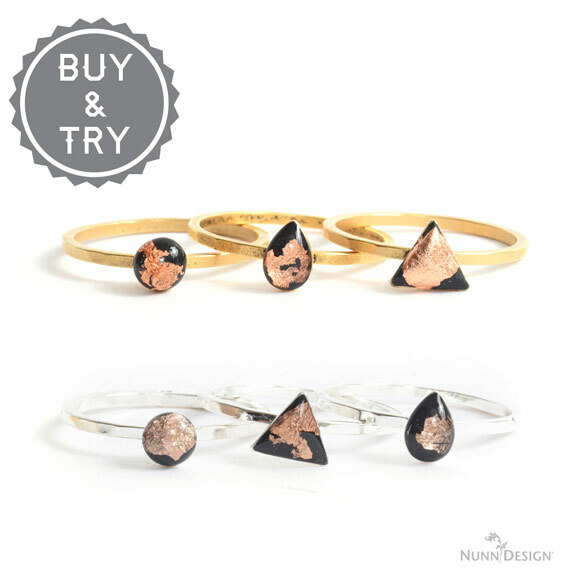 Nunn Design offers the Buy & Try Programs to encourage jewelry makers; both wholesale and retail, to buy the products needed to try something new. It is always exciting to see new techniques and projects, but sometimes it takes forever to gather the supplies for that afternoon of creating. 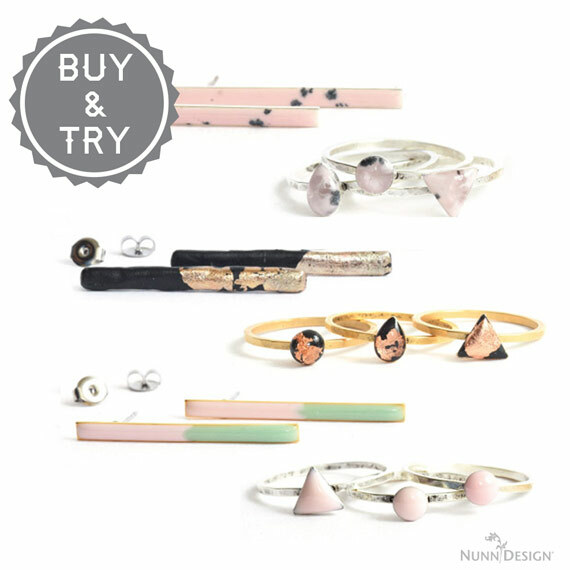 The Buy & Try Program allows you to: Be inspired and purchase just the items needed to explore the technique we are featuring. 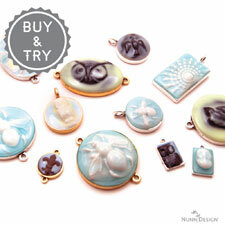 “Buy & Try” offers might contain items that we don’t typically have in stock! Purchase the “Buy & Try” products either a-la-carte, or in a combo pack. 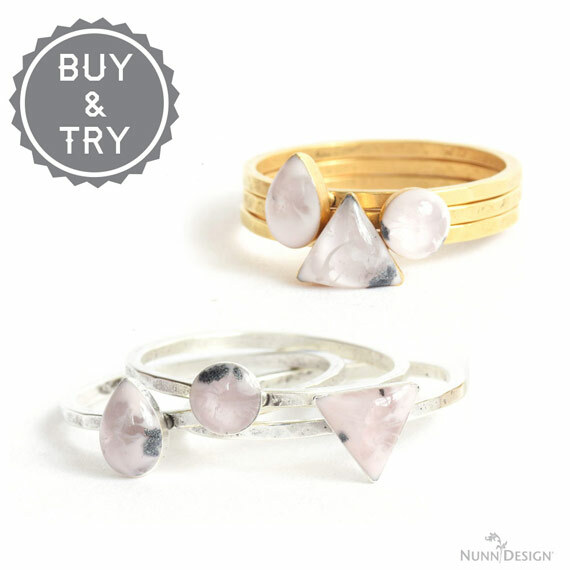 The Buy & Try offer expires November 5th at midnight. Orders will ship on or before November 5th. After November 5th: Buy & Try items will stay up for purchase after November 5th, however you will be required to purchase full bulk packs of findings and you may combine these items with regular wholesale items. $100 Minimum order back in effect. Bar Earrings with Colorized Resin & Pearl Ex Powder! 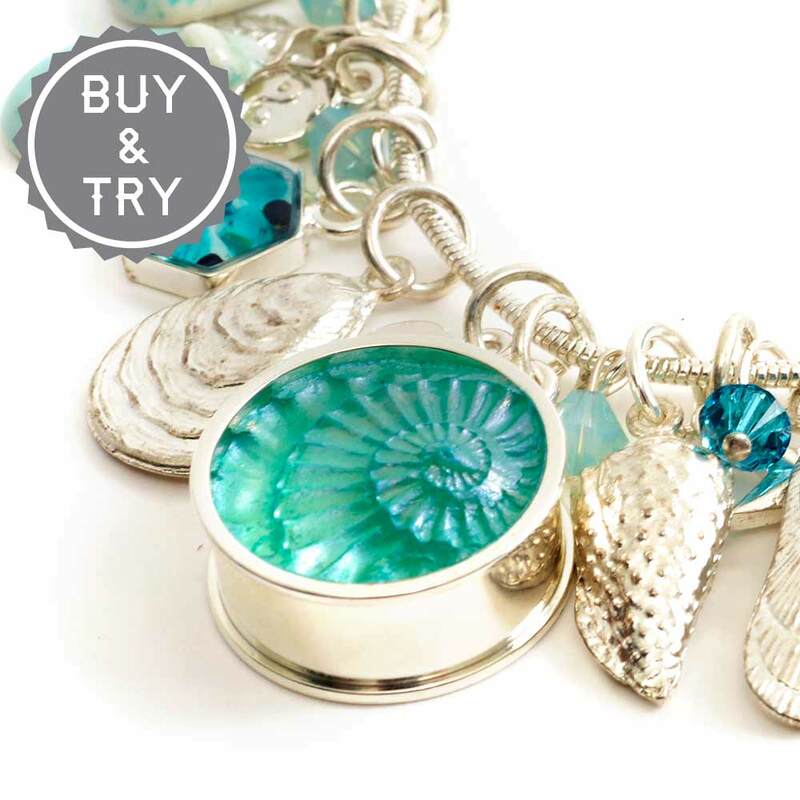 With this Buy & Try technique, a splash of PearlEx Powder over curing colorized resin provides that one-of-a-kind look to your jewelry offerings. 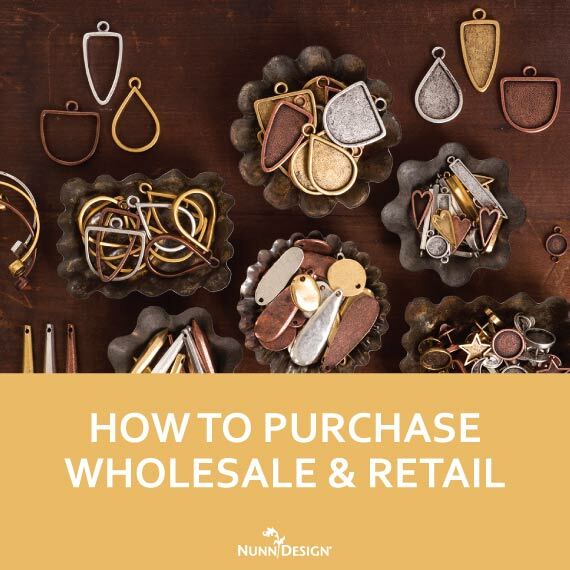 When your customers shop your booth at a show, at retail store locations, or on your website, they know they are purchasing a unique item. 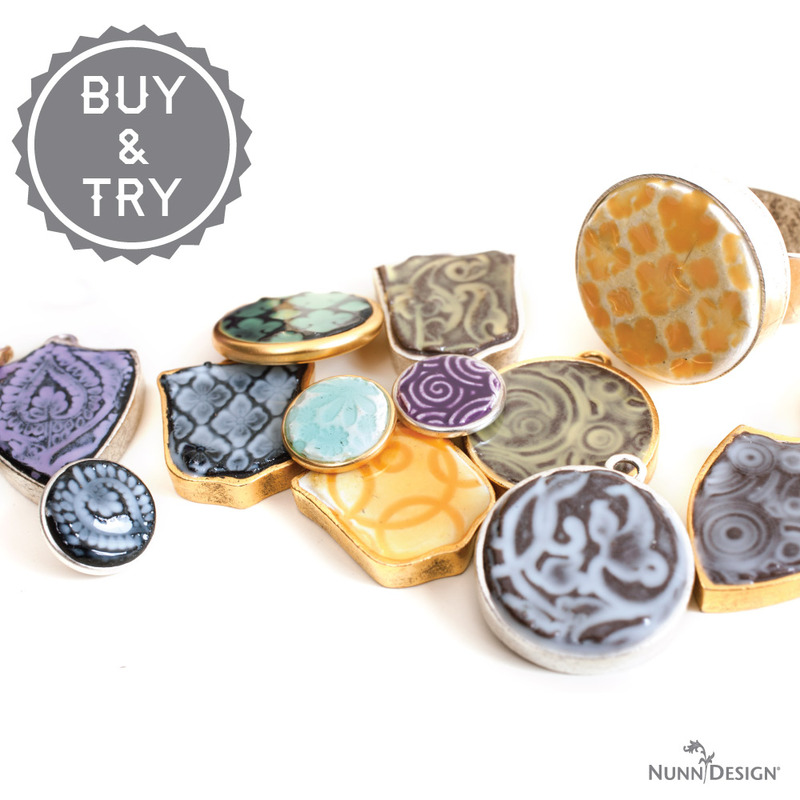 Hammered Bitsy Rings with Colorized Resin & Pearl Ex Powder! Have you ever been exited to make a tasty looking recipe? Has the excitement quickly faded as you read all the steps it will take to make that tasty looking food? It starts looking less tasty, doesn’t it? I have that same experience when it comes to making jewelry. I like jewelry techniques to be easy, yet have a look of sophistication. 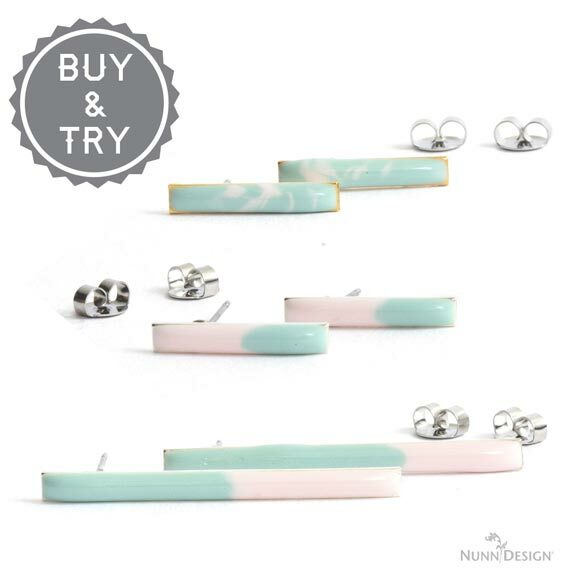 This Buy & Try – Hammered Bitsy Rings with Colorized Resin and PearlEx Powders – streamlines the resin process into a single pour. 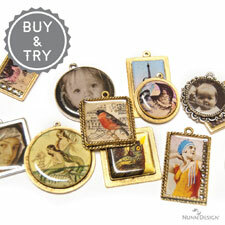 This makes it easier and quicker for jewelry makers to create a sophisticated piece of jewelry. I’m not going to deny my obsession with Gilding Flakes. It has been coming on for some time and I just can’t seem to get enough of them. 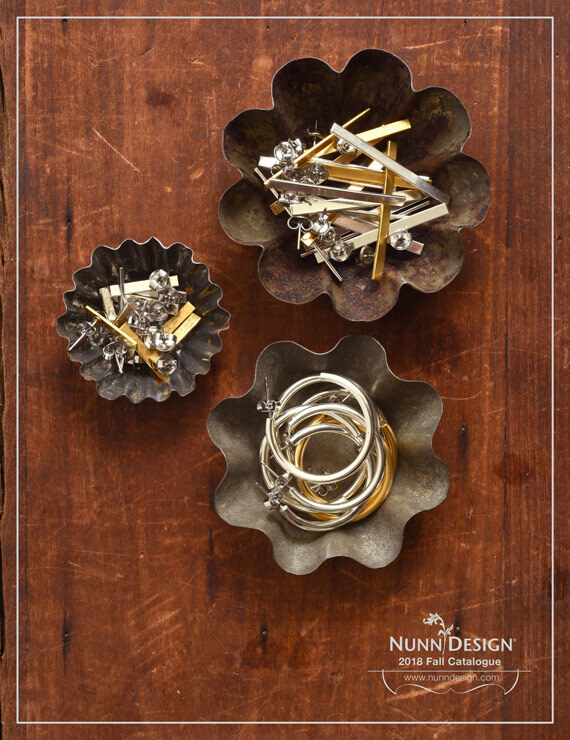 Gilding Flakes can be super elegant or casual, depending on how you create with them. These super lightweight gilding flakes are available in three metallic colors, bronze, gold and silver. 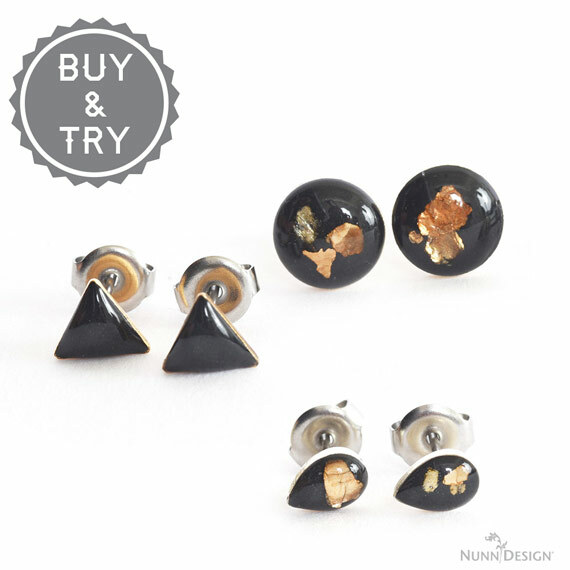 They are perfect for working with Crystal Clay! Slightly wet the tip of a toothpick and pick-up the gilding flakes. Tack the gilding flakes onto the Crystal Clay by gently touching the flakes to the clays wet surface. Gently rub the gilding flakes into the clay with your fingertips. 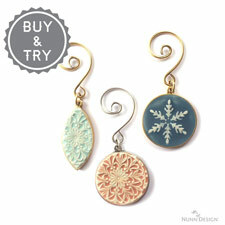 For this Buy & Try, we are offering the Nuvo Gilding Flakes from Tonic Studio in a very small re-packaged container. Test the gilding flakes out and explore them with this techniques prior to purchasing a larger container directly from Tonic Studio. 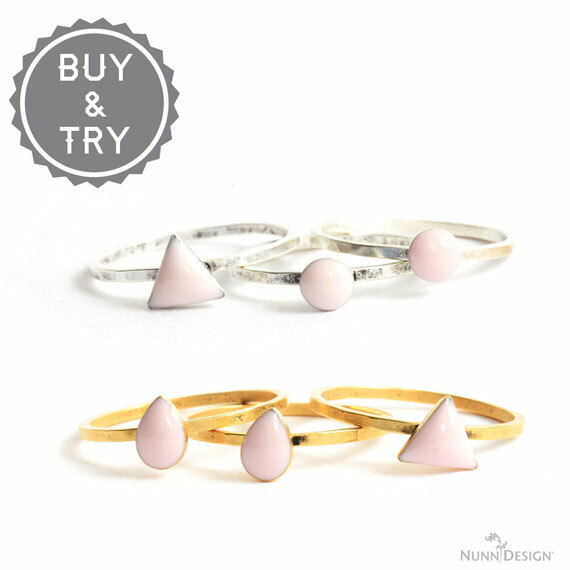 These Hammered Bitsy Rings with Crystal Clay are super fun and super fast to create! And take a look at how they stack together! Yes please!!! 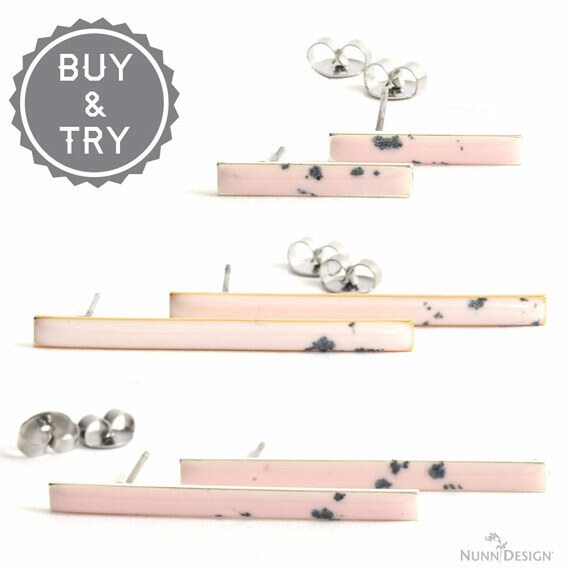 Although the Nunn Design Bar Earrings are a great contemporary stand-alone pair of post earrings, adding colorized Nunn Design Resin to the surface can really jazz them up. There is an endless number of color combinations that you can mix using the Nunn Design Resin Kit and Castin’ Craft Opaque Pigments. There is an endless number of colors that can be created using the Nunn Design Resin Kit and Castin’ Craft Opaque Pigments. With so many colors and several fun shapes, the stacking possibilities are endless!